My Avon Diary: FREE TO JOIN! Hey folks, just giving you the heads up that you can join Avon FREE this weekend (March 12-15). The straight goods is that if you wait and join after the 15th, it only costs $10 and you make that back right away so take your time, and when you're ready, if you would like an invitation, send me a message to newwestpacific@gmail.com. Avon ladies receive 25%+ off (even sales prices), meet a bunch of cool new people, have the opportunity to receive free training-- and that's just the beginning! There's never any pressure to sell at Avon, but we will train you and equip you so you can be the best Avon Lady you can be. Since I joined I've really enjoyed trying all sorts of Avon products and picking out my favourites. Here's one that I just started using that I think is pretty fantastic! In our current campaign (8) you can buy two items on pages 82-83 for 14.99 which is a 60% savings. I love this lotion because it's not only hydrating (e.g. water) it's also moisturizing (oil) which my very dry skin needs. It also is nourishing (plant ceramides) which my skin seems to need as well. Love it! 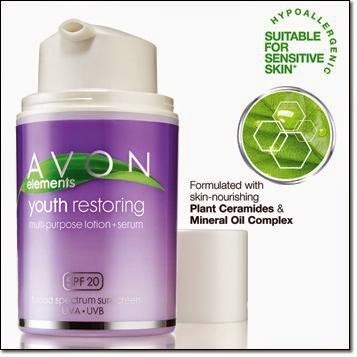 Any of the avon elements products are great for sensitive skin! Find what works for you, we have all sorts of different types of products, for everybody!